A Perfect setting for a casual meal, party, formal meal or anything in between. Our friendly staff will be more than happy to cater to whatever needs you may have. Good food. Very poor service (again) had to wait nearly an hour from ordering the deserts before they arrived despite asking the staff no effort was made to gee up the kitchen. To add insult to injury we were served coffee 25 minutes before the desert arrived. First visit since the new menu and price hike came in. Food was nice but we have had many Sunday roasts just as good at half the price. Service was very slow. Had to wait 45 minutes for desert to be served after mains. We preordered our food at 1045am in the morning of the day of the visit. We arrived at the pub at 12am. Half our group was not served until nearly 1pm. There were many customers arriving after us and we counted 9 that ordered (not pre-booked) their food well after we were seated and were served and their plates cleared before we had our main course presented on the table. Based on this visit I can not recommend the service here. The service failed. Table booking for 20. We pre-booked the food order so the staff knew in advance what we wanted and by their request they were phoned to have 20 mins warning before we arrived. We still waited 30 mins for our food and half of us had finished before the other half had been served. Food below par and not particularly hot. Although we had to wait a very long time for our meal everyone in the party enjoyed the food. It was a bank holiday so the staff were very busy but still were  pleasant and courteous. Very nice, helpful staff, good honest pub food. One of the nicest Sunday lunches I've had for a while. Everything was very tasty, I would have liked the sprouts a little less hard. The beef was lovely and also the Yorkshire pudding. I particularly liked the presentation. I thought it a tad prices but willing to pay for such a nice dinner. Staff very friendly and attentive. We had a lovely time! 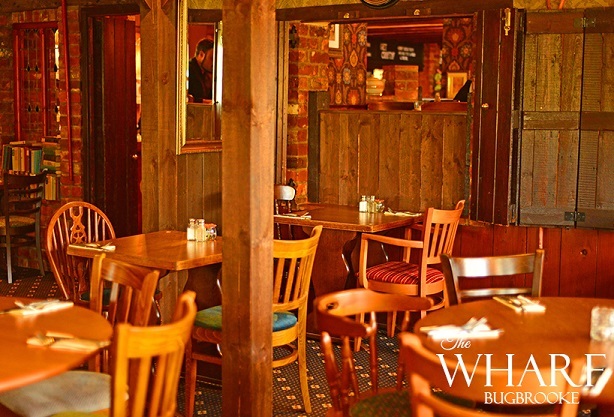 Food was very good, atmosphere was good, service staff very friendly quickly sorted an issue with our bill where things had been missed off. Very good service. Friendly and attentive staff and fantastic roast dinner. Food was poor and only Luke warm. Plates cold and we had to wait a long time between courses. The people are friendly, the service is excellent and the food is good too. A good choice on the menu. The staff were exceptionally helpful. We had a few fussy eaters in our party but the staff were happy to make the adjustments needed to ensure everyone's meal was perfect. FRiendly and efficient service. Food good. We went at 1800 and it was a little empty so atmosphere a little lacking in a large room. It did begin to fill up later though. Luke our waiter was very good and attentive,10/10. Food was hot didn't wait too long to be served, overall very good. I took my parents for their first visit to The Wharf and they were suitably impressed. We will be back. Very good service. Very welcoming to us and my baby. the furniture and decoration is tied, but our meals excellent with 25% off  made the long drive worth it! Sat between other tables, even though there were empties, so felt a bit crowded. Service was friendly. I had the chicken and bacon alfredo which was disappointing. Otherwise just what you would expect for the price. A wonderful Xmas lunch the food was first class. 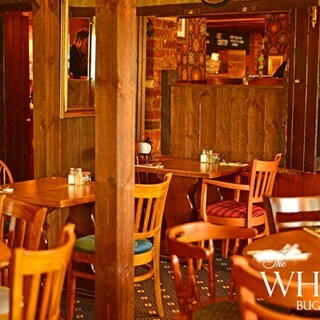 Lovely atmosphere and staff couldn't do enough for you. A perfect way to spend a stress free Xmas day. Thank you to all the team. Honestly,for me,the meal was a series of disappointments. I write here because I think you need to know but part of me wants to forget the whole experience. My salmon was  incredibly salty,my beef had little flavour,was chewier than I'd anticipated and cooked brown right through,the pastry on it was bendy and rubbery and the sauce with it was like bovril. Others in my party who had the beef agreed on these points. The veg were meagre and the sprouts were unpleasant,they seemed to be frozen sprouts partially cooked. The 3cake dessert was poorly portioned and the components  included thick ,heavy short crust, dry,tastless  sponge  which broke like biscuit, and a cheesecake which turned out to be ice cream with jelly beans on top. My mother's soup was barely warm. There were other issues but I realised on the 1st bite of the salmon that if I raised them it could become such a negative event that I or 2 in my party might feel very uncomfortable. And what else can I do since its Christmas day & there are no alternatives? I ate there with other large parties on several occasions before and the experiences had been a sequence of delights. This time I feel embarrassed that I'd raved about the food there and brought visitors from Hong Kong and the middle east there for our Christmas meal. A friend has said in these circumstances people are often offered vouchers to revisit the restaurant. I have to say I won't go back to that place again,most of the staff were in their coats at the door waiting for us to finish,even though we were well within the time limit as had been outlined to me in my call prior to the event. Just so disappointed,is all. 75gbp per head  is a lot of money, so the whole thing doesn't sit well at all. Thank you for giving us a special Christmas Day without the bother of washing up !! !